A great way to hook your customers! Custom lanyards may look small and almost insignificant at first glance but it would be a mistake to overlook their marketing potential. Considering their diminutive size these lanyards pack a powerful punch. Everyone loves receiving gifts that are versatile and can be used for multiple purposes and lanyards fit the bill perfectly. A lanyard is a corded string or rope that is often worn around the wrist or neck and has an object attached to it. It is most commonly used by employees to as a convenient way to carry around and display their ID card wherever they go. Lanyards are an everyday sight at most workplaces these days as most companies require that their staff all have their ID cards prominently displayed at all times whilst at work. Lanyards are used for several other purposes too. Dating back to 1626, a lanyard was a nautical term for a piece of rope or cord used to secure something on a ship or boat. Around the late 19th century, they began to be used by the military to secure their guns or swords in battle. The lanyard was worn across the soldier’s or officer’s shoulder and usually held either a gun or a sword.This helped the soldier or officer to retain his weapon in situations where it could otherwise easily be lost. While lanyards are still used by the military today, their purpose is not the same. Today they are used on the shoulder of the soldier’s uniform to indicate the regiment that the soldier belongs to or his rank. Lanyards were also very often used for carrying around whistles that are necessary for communicating with the troops. These days lanyards are used very casually by just about everybody and for the same purpose too - to keep a hold of your possessions. In some cases they have even become a fashion accessory, worn as jewellery, particularly when personalised with famous fashion brand logos. It is not uncommon to see people attaching a USB memory stick, pen, reading glasses or even their mobile phone to the lanyard dangling from their neck. Another item that frequently tends to get misplaced is keys. Attaching your car and house keys to a lanyard keeps them handy when you need them and is also the best way to keep them from getting lost. Lanyards are also very useful to carry around employee or visitor identity cards that need to be displayed often throughout the day. It may seem like a surprising choice but custom lanyards are very effective as promotional items. Here we explore some of the reasons why lanyards are such a good choice for promoting your business. Spreads Information Easily All Over the World- Lanyards that are customized with your message or brand slogan can spread the message to your target audience and market quickly and easily. Because the lanyard goes wherever the person wearing it goes, the advertising potential is endless. With lanyards, the advertising is not restricted to within your city or your neighbourhood only. Gift them to travellers for holding their camera, watch or compass and very soon news of your company will have spread around the world. This particularly noticeable with lanyards that are distributed to delegates at conferences and events. Versatile & Useful – Most people can never have enough custom lanyards. Even if an individual already has one, they will be only too happy to receive yet another one as they can always use it for carrying some other item. School kids and teachers can use them for holding their pencils, teenagers can use them for carrying their cell phone and sports coaches can use them to carry around their whistles more conveniently. Bear in mind that the more useful you make your lanyards, with the addition of additional accessories holders or perhaps interchangeable parts, potentially the more likely it is that the user will keep and use them for a long time to come. Tremendously Cost Effective – Custom lanyards can fit into the most rigid marketing budget. When you use them as a promotional product, you will end up paying just a fraction of what you would pay if you had chosen any other corporate gift. Unlike most other promotional products that can be only partially customized, lanyards are completely customizable. Each and every feature of the lanyard can be customized to suit your business and fit within your budget. you can choose the length and width as well as the material that you want to use, the material colour and design. You even have a choice of different attachments and accessories. The most common materials for promotional lanyards are cotton, polyester, nylon, bamboo fibre, cotton, satin and recyclable plastics. Long term, cotton and bamboo will not be as sturdy and durable as the other materials and can also be a little more expensive than the synthetic fibres. 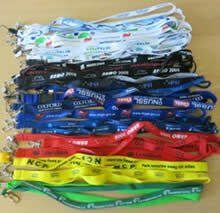 Custom Lanyards can be thick or thin and come in a wide range of widths, most typically from 10mm to 25mm. As far as attachments are concerned, depending on how your clients are likely to be using them, you can choose to add buckles, badge holders, spring clips, extendable badge reels, mobile phone attachments and pouches, drinks bottle holders and document or card pouches. You can print on both sides of the lanyard in any colour you want. Depending on the manufacturing process some can also have the logo details woven into the lanyard material. The length of an average lanyard is 90 to 100cm (36 – 39inches). If you print on both sides, that gives you 180cm to 200cm (72 inches) of space, plenty of room for including all the information you want. I usually advise my clients to aim to repeat their logo and details around the length of the lanyard to make it easier to read and communicate their message better. The complete message can then be seen at least 3 or 4 times (sometimes more, depending on the overall size of each). With so many different materials, colours, sizes and attachments, it’s hard to find another item that gives you so much versatility and scope for customisation. Lanyard material is generally printed or woven as a continuous length. The basic process is a screen-printing or transfer process for basic designs. For complex and full colour designs there is the dye sublimation transfer process onto smooth polyester, which results in vibrant detail and a stunning finish. This process is particularly successful on the wider lanyards from 20 – 25mm. The material is then cut at strategic points and fitted with the various accessories. The most cost effective lanyards, particularly for large volumes, tend to be manufactured in China. There are however manufacturers of high quality lanyards in the USA (for example the Snugz brand) and throughout Europe. Your promotional products supplier will be able to advise you on the best options, according to your design, budget and time available.